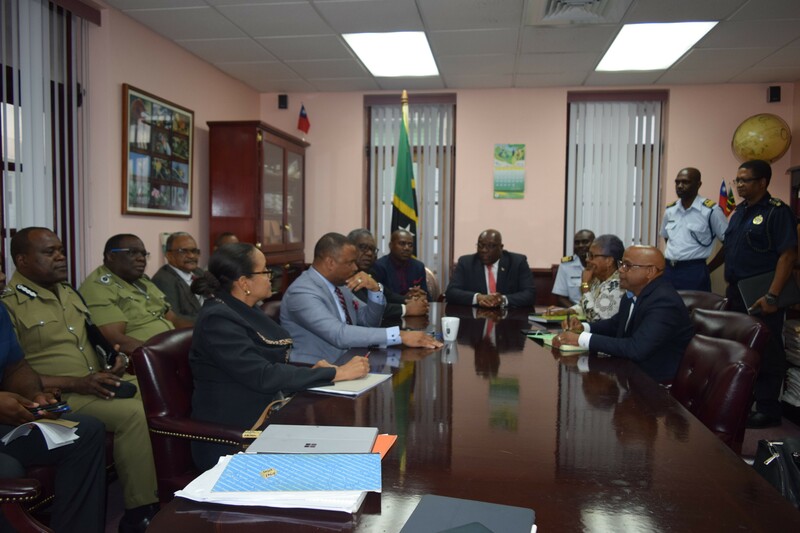 The Federal Cabinet of St. Kitts and Nevis met yesterday, Thursday, February 14th, 2019 with high-level representatives of the key agencies responsible for national security and border safety, including the Royal St. Christopher and Nevis Police Force, the St. Kitts-Nevis Defence Force and Coast Guard, the St. Kitts and Nevis Customs & Excise Department, as well as the directorate of the Ministry of National Security. Prime Minister and Minister of National Security, Dr. the Honourable Timothy Harris presided over the meeting where it was agreed that the unprecedented spate of violent crime, which has left six people dead since Friday, February 8th, demands an unprecedented response involving the participation and support of the general public and the entire body politic. The Federal Cabinet conveys sincere condolences to all families who have lost loved ones as a result of violence. The Federal Cabinet wishes to inform citizens and residents that it is considering all necessary steps and measures to protect public safety and bring those responsible for criminal activities to justice. If there was ever a time for a new approach to policing and securing our communities, it is now. As a result, nothing is off the table. The Federal Cabinet is committed to adding more teeth to the current anti-gang legislation in quick time, with the aim of effectively discouraging gang membership and deterring and punishing crime. The security forces have been mandated to apply maximum pressure on known criminal elements. It is anticipated that doing so might cause some inconvenience to the general public, the overwhelming majority of whom are law-abiding citizens. The Cabinet deeply regrets any such inconvenience to law-abiding citizens and seeks the support of the various communities to rid them of all criminal elements. The Security Forces have proposed and will immediately engage in a wide-ranging response, including but not limited to increased presence of security personnel in various communities, enhanced stop and searches, targeted raids, cordon and search operations, and deployment of technological assets, in order to curtail gang activity. The Federal Cabinet will be convening meetings and consultations very shortly with a wide representation of stakeholders in both St. Kitts and Nevis and will keep them and the general public fully abreast of developments. The Cabinet applauds the Ministry of National Security, which has moved quickly to respond to this threat to peace and security. Our people want and deserve results, and your Team Unity Government is committed to working with law enforcement, parents, teachers, church and civic leaders, the Opposition and with each and every one of you to control this situation. We cannot respond with business as usual. The time for firm, decisive and unified action is now. Our beloved Federation demands and deserves nothing less. We intend to confront this criminality resolutely and shall apply concerted and constant pressure until crime and criminality within our society is brought to heel.